Hello again! Here's some new-ness for you... This is a new song and video Lauren and I have been working on for a little while now called "Interface" which we really hope you enjoy. Let me know what you think! There's also another video in the video section of me and some friends fooling around on the guitar of my dreams at Rainbow Music in Omaha. I also posted a bunch of new pictures in the photos section and updated some links on the links page. I've been writing a lot of new music and hopefully I'll have more for you soon! Happy New Year! Hi all! So it's been a while... Hopefully most of you have had a chance to download "Above The Clouds" by now. If not then do that asap. And get lots of friends to do so as well ;) So the reason I haven't written in a while is I've been super busy moving to Portland, Oregon! So far it has been awesome. The vibes here are amazing and I have been full of inspiration. So if you're in the pdx area get in touch with me! Also, I was lucky enough to work on a project with 21 Productions. It is a short horror film called Tommy that I did the music/soundtrack for. Let me know what you think. I would love to do more projects like this. Today's the day! My new album "Above The Clouds" is now available right here for free download. The artwork was done by the brilliant Jeff Hamilton. A few tracks were done with some additional instrumentation from Josh Koleszar. Thanks to everyone that helped me out with it. I really hope you all enjoy it! Well, I have made another album. It's called "Above The Clouds" and as of August 21st, it will be available for FREE download from this website. Tell your friends. Yo... So, I've been writing and recording sO much that I haven't had any time to post any new updates. Til' now, that is... I have been full of inspiration lately. New songs and ideas just keep poring out. But, nothing is finished and I have no idea what to do with any of it yet. I could really use a drummer (or even a drum set I could use) if anyone knows of anyone (preferably in the Omaha area) please shoot me an e-mail. I've been thinking about playing some more shows soon too. Maybe with a band... but again nothing's for sure yet. I know, I know.. not much of an update but hopefully I'll have more soon. Thanks for checking back! Hey there! Happy new year! It's been a little while since my last post, so I thought I'd say hi and put up some more pics. I finally got a Rhodes piano! I've wanted one for a really long time so I'm super happy about it. It's sound is amazing. So, I've been playing that pretty much non-stop. I've also been writing a lot of new stuff... I put some photos up of my new toy and some others of me hanging around the house all winter. 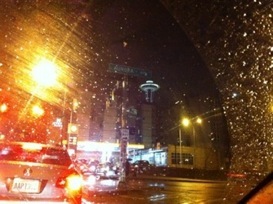 There's a couple photos of the winter solstice eclipse and some more random ones. I've had a music video I've been working on since Art in the Street came out and I'm not sure I'll ever get it done. I'm not really sure if there's even a point to finish it now... What do you think? Either way I'll try to come up with some more video or music or something soon. Stay tuned! Ok! So I finally put some tour stuff up: Click HERE to listen to my in-studio show on Hollow Earth Radio in Seattle. I definitely sound like a dork during the interview portion, so you can't miss that. I put some photos from the tour up. It seams like we took more pictures of food then we did of me playing, so looking at them might make you hungry. There is also some new video. So check out all that stuff and let me know what you think! Tour time again! It looks like I'll just be on acoustic for this one. I should have all the dates up by tomorrow. 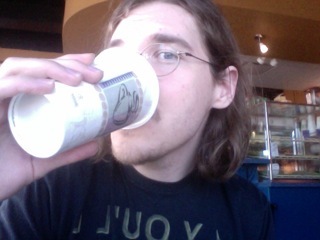 I'll be twittering and facebooking from the road, if anyone cares. Hopefully I'll get some video for you guys this time. I put up some random pictures from the past few weeks. Mostly the usual: cats, sky, food, park... Then there are some from a local protest, one from me trying to mod my phase pedal, a stamp I made, and other selected randomness. I'm sure I'll have many many more when I get back home. Wish me luck! So much is happening... It's fall all of the sudden, I've been brainstorming some new material, I'm still working on some video every once in a while, and I'm booking some more tour dates! I just have a couple booked so far, so if you have any suggestions let me know! It looks like I'll be starting the next little tour with Danielle Ate The Sandwich in Colorado and I am very excited about it. Hope to see you all soon! So I kinda' have all the dates for the mini-tour up. Still not sure where or when for Chicago and Evansville, but I should know soon. I'm starting to get excited about it. I'll get to see some old friends and hopefully make some new friends too. I put some more pictures up. The first 9 of them are of this really strange day when everything was a yellowish-red and there were really strange clouds on one side of the sky and a full rainbow on the other side. T' was very surreal. Then there's some other sky shots from different days and some other stuff... hope you like em. Oh, and there's one of my friend Josh attempting to fix his old Nintendo system. Anyway, wish me luck on the tour! It's been a while since I put any new pictures up, so I picked a few random ones out for ya. Nothing special... most of them are taken with the cell phone. I also added a date in Bloomington, IN. More dates are on the way hopefully, so keep checking. If you have anywhere you think I should play, let me know! The next round of CDs are here! So if you didn't like the last ones with black ink, maybe you'd like the new purple ones? Or, maybe you just want to collect all the colors? Either way, just pick which color you want and hit the buy button! As you may or may not know they're $12 with free shipping and a free sticker. I don't have a whole lot of the black ones left so if you still want one of those get em while they're still here! I put my first date for Kansas City up and more tour dates should be up very soon, so keep checking back! Well the album is getting around... So far I've been hearing mostly good things. I've been trying to figure out where to play shows this summer so if you would like me to play in your town feel free to shoot me an e-mail and give me some venue ideas. I'm also working on a couple videos, who knows when I'll ever get them done... I put some new pictures up... some of them are from the earthday celebration at elmwood park and there are some of my buddy's old printing presses. 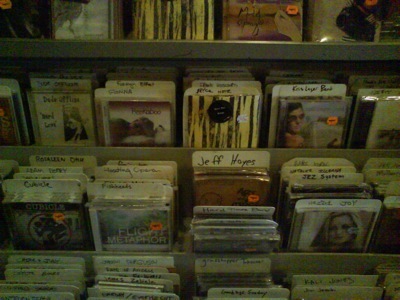 Also, if you're in Omaha NE, my album is available at either one of the Homer's locations and Antiquarium Records. Or, if you're in Louisville KY, you can find it at ear X-tacy. 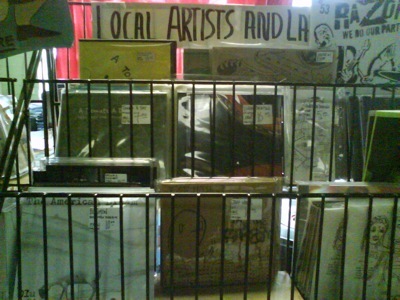 Stop in and support your local indie record stores! The digital download of my album is now available at CDBaby, Amazon and iTunes! I'm hopefully going to start playing more shows soon, so keep checking back for details! 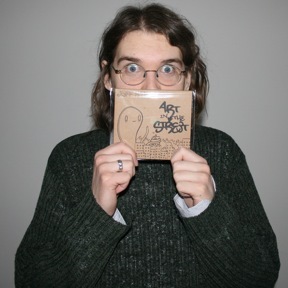 My CD is officially out! ...Finally... Now go to the 'Music' section and buy it! Buy multiple of copies of it. Tell your friends and family about it. Tell them to buy it. Love it. Cherish it. Enjoy it over and over again. But be careful not to get sick of it.... like I have. It's called "Art in the street" and as I said in an earlier post, the art was done by my friend Jeff Hamilton. It was printed at a place called Sire Press and mastered by Bill Henderson at Azimuth Mastering. 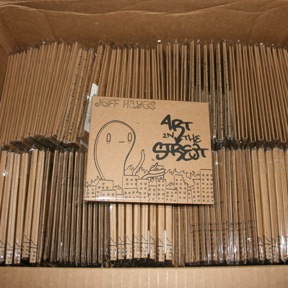 For now I'm throwing in a sticker with each CD you buy off this site. You can also buy the digital download through CDBaby. I put the lyrics up in the 'Music' section and you can listen to the whole album on the player at the bottom. It should be up on iTunes, Napster, Amazon, and all the others soon. I really hope everyone likes it, and thanks again to everyone that helped me out with it!!! Well, I'm still here... I think I'm finally done with recording... now on to the complicated stuff. 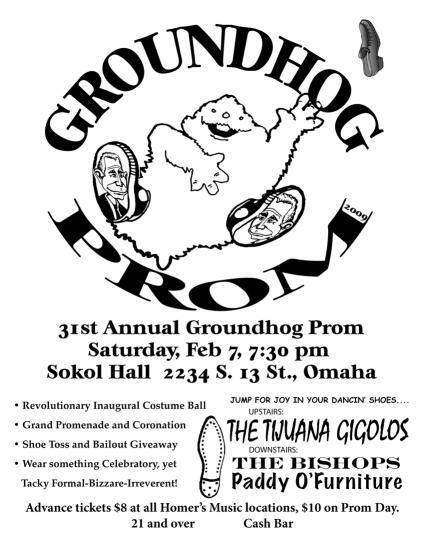 I noticed that I have the flyer for last year's Groundhog Prom on this page... Well, it's that time of the year again. If you're in Omaha tonight, swing by the Sokol Auditorium for a good time. I'll probably be there, if I can find a good costume by tonight. Hopefully I'll have a few site changes coming soon. For now, I put some more pictures up.... everything from our vegan t-giving to some snowy-ness to some more of my boring 'new equipment' photos. I'm still hoping to get to those video ideas I've had for a while. ...I wish this snow stuff would quit. I miss the grass. It's been a little while since I posted anything, partly because I've been super busy but also because we don't have internet at home anymore. It was nice while it lasted. But anyway, I finally put some pictures and a video up... The pictures are pretty random again, but there is one of the stylaphone I got and one of a midi controller I found at a thrift store a while ago, if you can believe it. There's also some pics of a little lighting experiment we did. 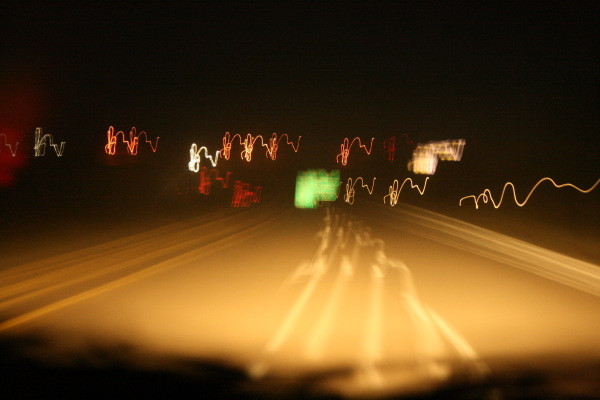 I think I'm going to turn something like this into a music video eventually. The new video I put up is just a long worthless video of me "working" on the album. My computer sounds like a helicopter and the cats like to try to help. I tried not to give too much away as far as the music goes. I have a lot more video ideas, so hopefully I can get around to working on them soon. Til' next time, I hope you enjoy the new stuff. Also, don't forget about Buy Nothing Day this year! Hey everyone... still working on the album. It seams like it's taking forever. I think I have an album name and I'm pretty sure I'm going to have it done at sirepress.com. My friend Jeff has started on the artwork and I'm really excited about it. Now... to finish the damn music! I will put some videos up soon. No, really, I mean it this time! I'm not promising they'll be anything special though... I'll be back soon! So, for those of you that were not aware, my brother Rob is also a musician. He recently took it upon himself to add an extra vocal track to the song Blind. It's really good, so here it is! I'm still working on the album, and it's going along nicely. Hopefully I'll find a way to actually release it before I'm done recording it. I haven't really gotten around to those videos I promised yet... but they're still coming... I promise... again! So yeah... Happy hug a vegetarian/vegan day. I'll be back soon. Here's a video I did for my friend Cliff... It's about Keith Olbermann's 'Worst Person in the World' segment on Countdown. Be sure to tell everyone about it so Olbermann plays it on the show. That movie was really good... It would be a great introduction to how the food industry works, for someone who doesn't know. And how they don't really care about nutrition, only profits. So go see it! ...Anyway... I have more songs coming. In fact, I can't record them as fast as I'm writing them... I've decided to do an album. I'm going to do it myself, because I'm not having much luck finding a label. So, if you'd like to donate me a little bit so I can get that done a little faster, that'd be great. The link is on the bottom-right. If not, that's okay too! ...I probably wouldn't. I also have a pretty good idea for a new video, so I'll be working on that soon. I've been told by some that the songs on my site haven't been working, but I haven't been able to find any problems. So if you run in to anything like that please let me know by sending an e-mail to me at info@jeffhayesaudio.com. Also, if you live in Omaha, a new restaurant called Clean Plate is opening up this Saturday. They serve organic, local, and vegan food. But they'll only be open for about a month, so go check it out! Hey everyone... I've got another song up called 'Blind'... I hope you like it. 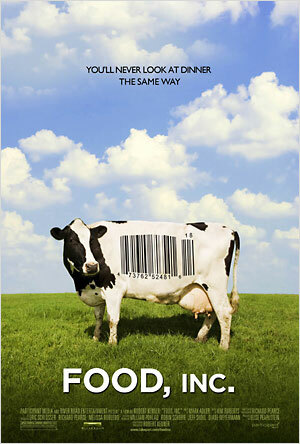 Tonight "Food, inc." opens here at Film Steams in Omaha, and I can't wait to go! It looks like it's going to be a really good flic... I'll letcha' know! I put a new song up called 'Life's Work'... It's one of the first that I'm doing with some of my new equipment. It's the first song to play in the player on the bottom of the page and it's also on the music page to download. Let me know what you think. I hope you like it. :) More is on the way! So, I've been pretty busy lately... I won't get into a whole lot, but I got some new music software that I've been experimenting with and I've also been writing a lot. I've been working on other peoples websites. I've been doing some video editing. I'm working on so much different stuff at the same time that it's been a while since I've gotten anything entirely finished. But I did finally put some pictures up! There are a couple of my new computer. There are some of my new condenser microphone, and some at Rainbow Music. One is a picture of the Icicle, which lets me plug my mic into the computer through USB and draw phantom power. Then I also threw in some pics of the cats in my guitar case, me and my girlfriend Lauren locked out of our apartment during a visit from my mom, some pics of the new pedestrian bridge here in Omaha, and some yummy vegan pizza we made. I should have a barrage of new songs in the coming weeks, once I finish recording them all. Maybe it's time to make an album? Well, it's been a while since I've been able to update. My computer got all messed up, so apple gave me a newer, faster, better one. :) I got a new condenser mic a while ago, but I haven't been able to use it because of my computer, so I can't wait to record more. I've written lots of new stuff. I'll have new pictures of it and other stuff up soon. I should have new songs and video up soon too. Also, I've heard that the link icons in the bottom right corner of the page have not been showing up on some computers, so I'll be fixing that soon. Keep an eye out, stuff is on the way! Hey everybody.. I put a new song up, but I don't think it's quite done yet, I think I'm going to add more to it later. I've been writing a lot lately. I think spring is a really creative time for me, I just wish it felt a little more like spring outside here in Omaha. I bought a new archtop from Hargiss. It sounds great, I can't wait to record it. I put some new pictures of it up, too. I put some new pictures up. My girlfriend Lauren finally let me show a picture of her. Then there's some random ones. The velcro on my pedal boards started to come off, so I took them to rainbow and Nils stapled them down for me.... Thanks Nils. In other news, I've been working on Lauren's website for a bit so I haven't recorded much, but I'll be getting right back to that shortly and I have some really good songs coming. Be sure to check out Lauren's newly designed site. (abstract-mind.com) Also, just a reminder: I'm still looking for people to jam with and I'm always interested in doing some film music. - Happy St. Patty's day. Cheers. I want to make music for a film. If anyone makes movies or knows someone that does, please shoot me an e-mail at info@jeffhayesaudio.com. I just got a new mixing program that I've been playing around with. I made this while trying to figure it out. It's all digital beats and software instruments, but it was just for fun. To download, right click and press save target as. Well the groundhog prom was a great time and I have lots and lots of video of the bands' performances. I'll put some stuff up once I go through it all. Til' then, I did put up a new video of some clips from a jam I had with some of my friends from the band Paddy O' Furniture a couple weeks ago. It was good times. Hope you like it. I still have more videos and songs coming soon, I promise. I've been busy... I've been recording, but not finishing anything. I've been working on some websites for friends. I'm working the crappy day-job. Now I'm preparing to record my friends Paddy O' Furniture at the Groundhog Prom. I've attached the flier below, come check it out. I haven't gone before, but I hear it shouldn't be missed. Well, there's finally a few new things up... There's a new tune, new pics, and a new video. The tune will have a video to go with it soon. The pics were taken a while ago and I finally put them up. If you like the way those stickers look just shoot me an e-mail and you can have one. The new video is me and Lauren at our friend Nils' music shop. 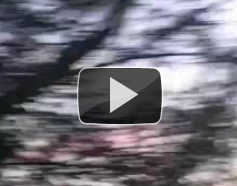 It's a completely worthless video, but I put it up anyway. I'm working on some more songs (ones with lyrics for a change) and some music videos, so stay tuned. Okay, don't be mad at me, I know it's been a while since I've done anything to the site... I've been working the day job mostly and when I'm not at work I've been jamming and hanging out with my buddy Nils. He owns the instrument shop and studio called Rainbow Music. If you live in Omaha, you should definitely go check it out. I also put the link in the links page. I have some new pictures, but I just have to take time to put them all up. As for music and videos, I know you don't believe me by now but they are still on the way. I have been working on numerous songs and I've been trying to make a music video. I'll probably put some random videos up soon, but don't be disappointed when they're boring and pointless. I won't be working as many day-job hours soon so I'll have more time to work on important things. Thanks everybody for still checking my little site. If anyone in the omaha area wants to jam, write me an e-mail. I'm still recording, so there should be more stuff to download soon. I'm also looking for a day job, if anyone has any suggestions. I'm running out of money. I also thought I should say, if you are currently not planning on voting for Obama, please do. Thanks much. Hey. I am recording. More stuff is on the way. I am looking for a record label and shows. Check out THIS LINK. Ok, so I've updated all kinds of things... There are a few more pics, there is more music to download, I've changed my links page a little bit, added links (Slowdown & ScottBlake), and a bunch of other stuff. I've been roaming around Omaha all week going to different venues and enjoying a lot of local bands. I've also been giving this website URL to some people. I really love it here so far. Everyone feel free to e-mail me about anything at all. I'm going to be writing and recording some new material I've been working on, so I'll keep you posted. Well, I now live in Omaha, NE. and I have some more stuff up: There's a new video of me just messing around with my pedals, but if you are listening to it on tiny computer speakers it might be kind of annoying, I dunno... I've also put up my bio in the 'Story' section. There is also some music you can download. So yeah.. Enjoy... There is more on the way, once we get our furniture into the apartment.